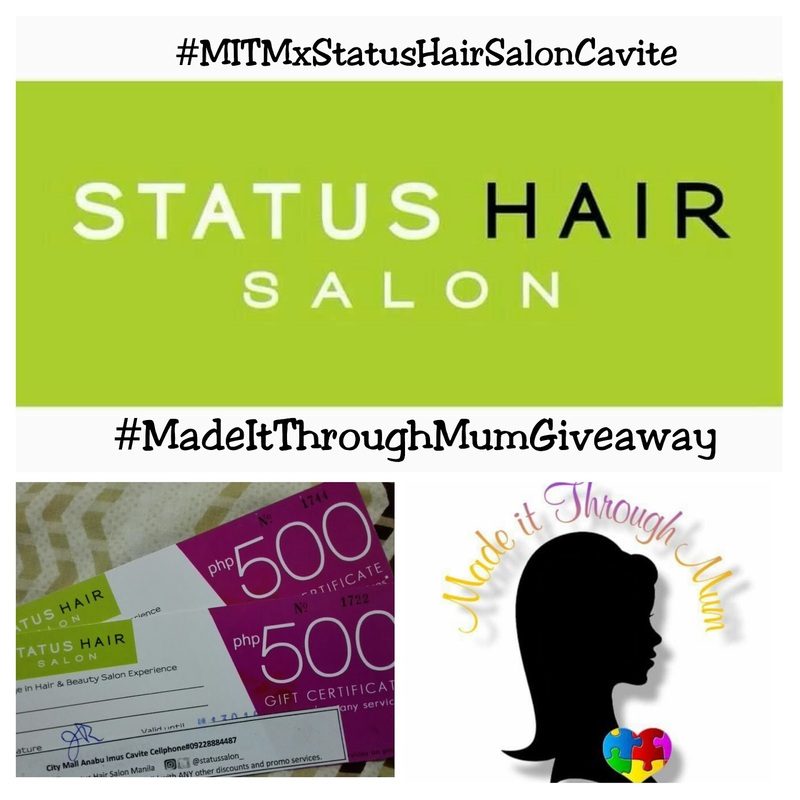 Made It Through Mum: Love is in the Hair at Status Hair Salon Cavite : My Awesome Experience + Giveaway!! 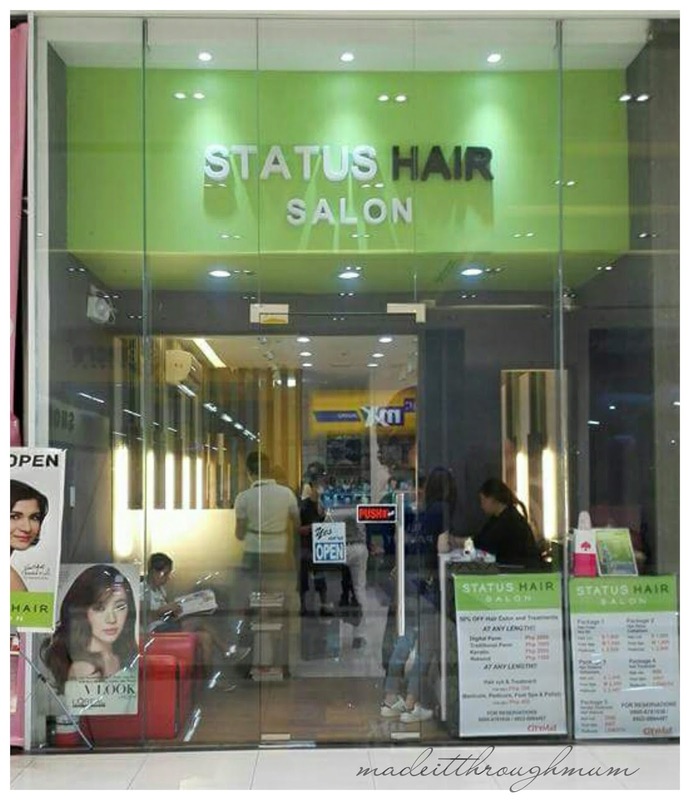 Love is in the Hair at Status Hair Salon Cavite : My Awesome Experience + Giveaway!! Recently, I have posted this photo on Instagram with the caption "Dizz iz it... virgin hair no more!" Why? Salons refer "virgin hair" to hair that has not been altered by perms, dyes, bleaches or not chemically treated one way or another. It's not that Ive not visited a salon since birth (haha) because I'm a "suki" (I used to frequent salons) until meningioma happened to me. If you have read The Story of My Life (Click here) you would know that my hair was shaved prior craniotomy in 2013. Until I decided to have a change. Yes. #ChangeIsComing . I desire for a new look. naks! Not that I don't like my hair ha? I super love my uber black and thick, wavy tresses. But it bothers me to see my "wisdom highlights" (grey hair) underneath my bushy locks. Oops! For those who are concerned, this is with my nuerosurgeon's consent of course, a year ago pa. 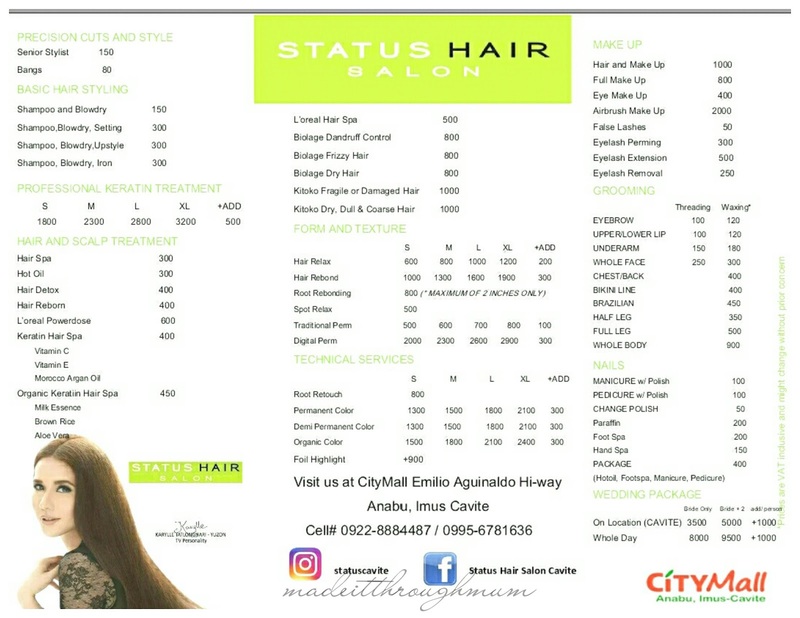 I was one of the chosen few to get an invite from Status Hair Salon Cavite via Ms. Aisa (@paxieness) And so I went with my blogger friends to check on their newly opened and first in the south salon in City Mall, Imus. The mall is new that's why some establishments are not operational yet. 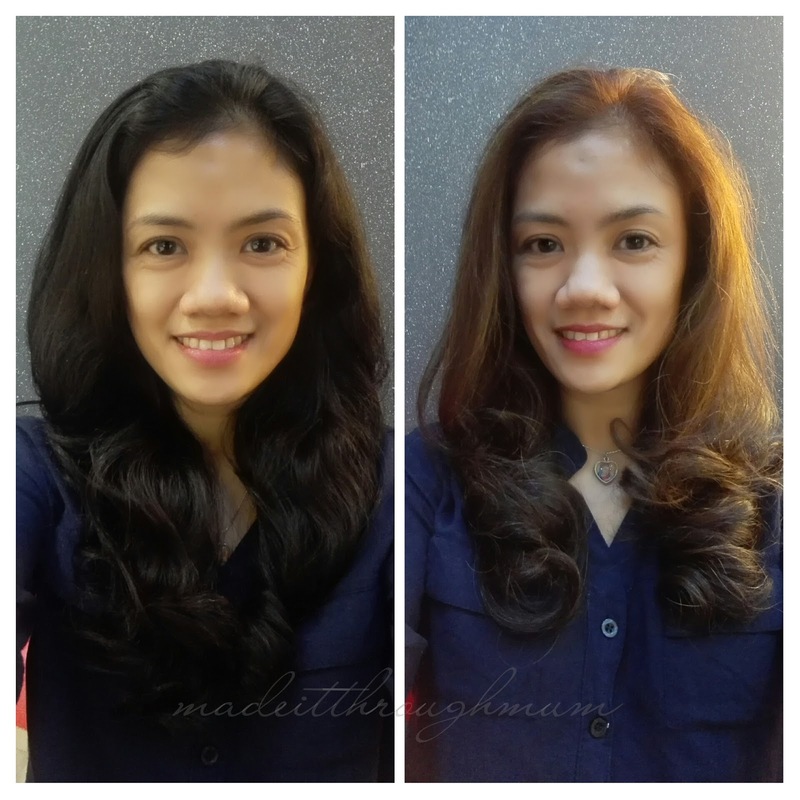 Everytime I go to salon, I know exactly what treatment or service I would like to avail. Im very particular especially with my hair. I even showed them a picture of the hair color I like. But due to time constraint and what I want is "mabusisi" (time consuming and so many process) the Senior Stylist, Mr. Jin advised me that we won't be able to achieve my desired color but assured me that he will try his best. Having known to being customer oriented and a trusted salon, I gave in. I just trust them but still hoping and praying it will come out fine. After almost four hours... tadaaa!!! How do you find it, sweeties?! Overall, Im amazed, satisfied and one happy customer. People like him deserves a pat on the back and of course a tip! Yes, I give tip when it is due. If I'm not satisfied I won't. Hehe. Haistylists bring out the beauty in you,agree? 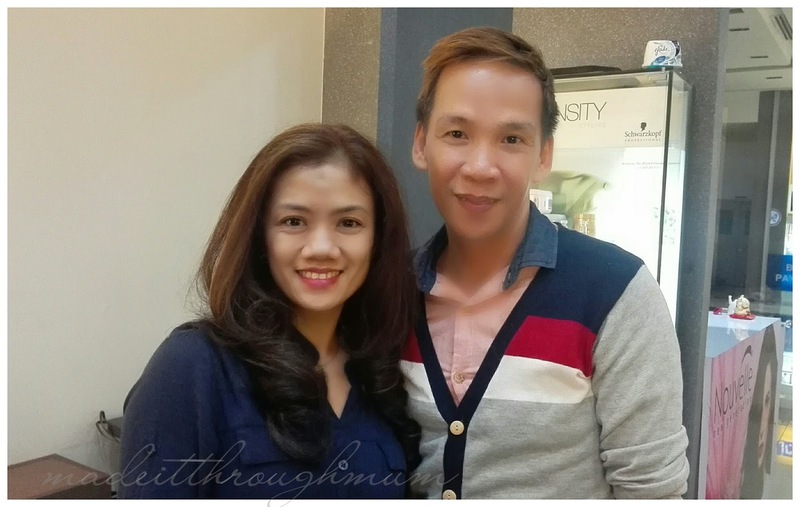 Meet the Senior Stylist of Status Hair Salon Cavite, the one responsible for my rockin' Ash Blonde hair, Mr. Jin. Who knows I might go edgy and bold next time...how about red? Teal green? Yellow! Rainbow kaya? Hehe. Why not? I can do all that without putting hole in my pocket because Status Hair Salon Cavite got a whole year discounted promo in any hair colors and treatments. This chain of beauty salons is owned and operated back in 2011 by sisters/business partners Robina and Roseann Ko, and in 2014, awarded as Best Choice High-End Beauty Care and Treatment Salon [Best Choice Award]. This first franchised branch in the south is operated by friends – Ms Erika Tan and Ms Jizlynn Co.
3. Google +1 this post. 4. 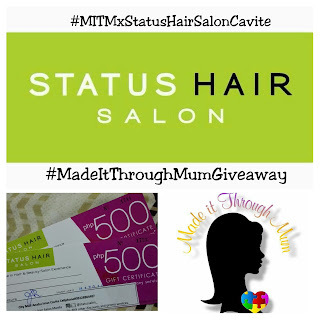 Share the giveaway poster with hashtags #MITMxStatusHairSalonCavite #MadeItThroughMumGiveaway in Instagram. 5. Share the blogpost article on your FB (set to PUBLIC) tag 3 friends with the 2 hashtags. 7. Comment on my post in IG your name, area and tag 3 friends and ask them to join as well. Your hair is your best accessory. Invest in it because it is the only crown you never take off. will definitely follow you there boss Jin! Hi MITM, thank you for giving out another giveaway. I have a wavy hair and I had it rebonded two years ago. I had my frequent visit to hair salon to have it trimmed but I never had it rebonded again because I have a lot of hair fall. Hope Status Hair Salon will treat my hair and of course style it based on my face's shape and since I am working, hope I can get a hair color and style that will really boost my confidence inside out. Thank you and More Power! By the way, Kudos to the Sr. Stylist because you've got a perfect hair, I love and it really looks good on you. Thank you for sharing your blessings and for hosting this giveaway. Status Hair Salon will surely make you a real statement. I love how they colored and made your hair, you look younger and vibrant. If given a chance, I want to try their hair cut and hair color. I want the Senior Stylist to style my hair. Thank you MITM.